Tony Hawk HD is the first Summer of Arcade release on July 18th and will be the day when you can get some new free content for Minecraft and Trials Evolution! 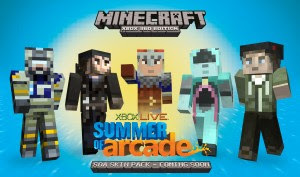 For Minecraft, you'll be able to receive an exclusive skin set which is based on the new releases, and tracks for Trials Evolution which center around the games. All you'll need to do is download these items from either the dashboard or ingame for the tracks on Trials. I also believe you have to be a Gold Member. This Summer of Arcade is looking pretty good too. Can't wait to play Tony Hawk again, but I really want to get Deadlight!